A tiny galaxy has been discovered in the Milky Way’s backyard and astronomers are now wondering just how many of these diminutive dwarfs are hiding in the intergalactic undergrowth. 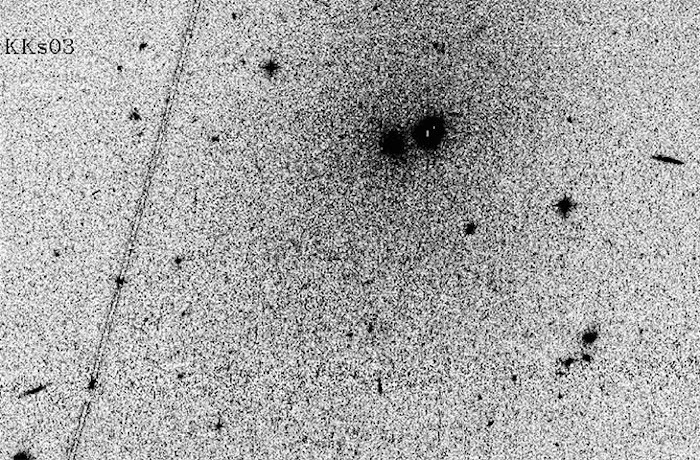 Using the the Hubble Space Telescope’s Advanced Camera for Surveys (ACS), a Russia-led team of researchers managed to pinpoint dwarf galaxy KKs3 approximately 7 million light-years away in the direction of the southern constellation of Hydrus. That may sound far away, but KKs3 is well within the famous Local Group of around 50 known galaxies that the Milky Way and Andromeda galaxies inhabit. Weighing-in at only one ten-thousandth of the mass of our galaxy, the “dwarf spheroidal” (or dSph) galaxy is lacking familiar features such as spiral arms and is a comparative lightweight, but its discovery has led the astronomical community to ponder just how many other dwarf galaxies like KKs3 have gone undiscovered. Dwarf galaxies are fascinating objects as they lack the gas and dust needed for new generations of stars to be created. As such, dwarf galaxies are ancient and observations of their stars is akin to a cosmic archeological dig. As they are so old, the stars are also very dim, making dwarf galaxies very difficult to detect. These dwarfs are usually found orbiting larger galaxies (the Milky Way and Andromeda are known to have several satellite dwarf galaxies) and their star forming gases are thought to have been stolen by their more massive galactic neighbors. (Even worse, large galaxies are thought to have cannibalized many dwarf galaxies during their formation.) But KKs3 does not appear to be in close proximity to another galaxy; it is completely isolated and joins a very exclusive club of only two known isolated dSph galaxies. The only other isolated dSph galaxy in the Local Group is called KKR 25 and was found in 1999. It is thought that isolated dSph galaxies evolved in a different way to their massive galaxy-orbiting cousins. Away from any gravitational interference, isolated dSphs likely retained all their star-forming gases, but consumed all of it quickly in a flurry of early star formation. Lacking any modern day interstellar gas, astronomers have to scan intergalactic space very carefully so not to miss their faint stars. This is the reason why Hubble hasn’t detected any dSphs beyond the local group. “Finding objects like Kks3 is painstaking work, even with observatories like the Hubble Space Telescope. But with persistence, we’re slowly building up a map of our local neighborhood, which turns out to be less empty than we thought,” said Dimitry Makarov, of the Special Astrophysical Observatory in Karachai-Cherkessia, Russia. The team will continue to seek out more nearby dSphs in Hubble data, but the task will be made simpler when next-generation telescopes like the James Webb Space Telescope (JWST) and the European Extremely Large Telescope (E-ELT) come online in a few years time.